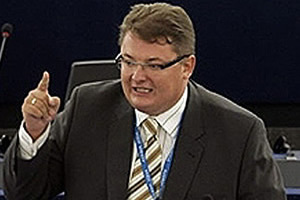 David Cameron's attempts to detoxify the Tories took another step backwards this week when one his leading MEPs launched a full on defence of Michal Kaminski. David Cameron’s attempts to detoxify the Tories took another step backwards this week when one his leading MEPs not only stood by his remarks about “climate hysteria” and the “Great Carbon Myth” but launched a full on defence of his friend Michal Kaminski, attacking former Tory MEP Edward McMillan Scott for speaking out against the extremist. “Michal Tomasz Kaminski? Anti-Semitic? … Linked to far-right organisations? No. Kaminski is proud to recall that during the Second World War, his two grandfathers were fighting the Nazis. Kaminski claims that he was in NOP ‘as a schoolboy’ before the fall of communism in 1989, but an NOP spokesman told the Daily Telegraph he was in it from 17 – 20 years of age, his formative political years: “He was in the party from about 1989 to 1991” said Marek Wojciechowski . McMillan-Scott has confirmed this statement. • In 1993 Kaminski was the spokesman of the right-wing Catholic Electoral Committee “Fatherland”. He handed out pamphlets at Warsaw’s main train station denouncing immigrants from the east bringing “typhus, malaria and other diseases” to Poland. • In 1999 Kaminski travelled to London with other Polish right-wingers to visit General Augusto Pinochet, the Chilean dictator who was being detained in the British capital. “This was the most important meeting of my whole life,” he told the BBC at the time. • In July 2000, Kaminski caused a scandal after his public declaration of support for the infamous pre-war slogan “Poland for Poles,” which was traditionally directed against Jews and invokes memories of the anti-Semitic violence of the 1920’s and 1930’s in Poland. “I want us to have the courage to say, ‘We want Poland for the Poles'”. There is more on Kaminski and Tory extremism in Europe here, here and here and on Left Foot Forward here. RT @leftfootfwd New Tories? MEP Roger Helmer: Kaminski friend and climate denier http://cli.gs/1u586 < appalling, objectionable human being! You claim to be evidence based; Roger Helmer resigned from the Tory front bench in the EU about 5 months ago, that hardly makes him a leading MEP or in anyway significant to the Conservative party brand or policy process. I’m happy for you to disagree with his sentiments but trying to dress up this partisan sniping as ‘evidence based’ is clearly wrong. Evidence based? Really? – I suppose you will also say that Edward McMillan-Scot is also insignificant…? An ex-senior Tory MEP, expelled in a row over the party’s new allies in Europe, has joined the Lib Dems. Edward McMillan-Scott, who once headed the Tory grouping in Brussels, was unhappy with David Cameron’s decision to re-align the party in Europe. Lib Dem leader Nick Clegg said he was “delighted” to welcome an MEP who was “respected… across Europe”. Mr McMillan-Scott said he was “pleased” to join the party. Good work on unearthing the leader of the Conservative Party’s faction in the European parliament; Michal Kaminsky’s fascist background. Cameron’s attempts to detoxify the Conservative Party is an empty Public Relation exercise and Kaminski’s unsavoury opinions on the Jedwabne massacre and his opinions on gay people prove it. Your use of the term “climate denier” can only be a deliberate lie. I have repeatedly stated that climate change happens, and has always happened, and always will happen. I have publicly stated that anyone who denies the plain fact of climate change is either a fool or a liar. What more do you want? Considering what both i and roger have said on this issue- will you amend so that evidence can be included in your blogging? @liz macshane, no i don’t think its particularly significant. If the Conservatives were in the slightest bit bothered by Ed Mcmillan- scott’s party allegiance they wouldn’t have sacked him. And don’t even get me started on Helmer’s first Climate Change Conference in the European Parliament where he claimed that no one really cared if the Democratic Republic of Congo, or Robert Mugabe’s Zimbabwe got hotter! You may not care about the ordinary people of those countries who are the ones that will suffer, but I do! What a splendidly shifty posting from Roger Helmer MEP. Kaminski a far right extremist? Please, these are bare faced lies. How dare you. Left Foot Forward, evidence-based political lies and distortion.